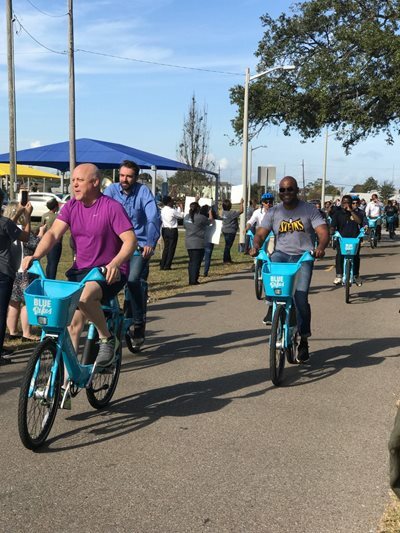 In partnership with Social Bicycles, Inc. (SoBi), the City of New Orleans has launched its first bikeshare program, Blue Bikes. As of December 5, 115 smart bikes are available for rent at 15 stations from downtown to City Park in New Orleans, Louisiana. Over the next several weeks a total of 70 stations and 700 bikes will become available, with yet more to be added later. Users can access the bikes by signing up for membership online or via mobile app. Bike rental costs $8 per hour, but a $15 monthly pass can be purchased that allows users to ride for up to one hour per day with no additional charge. (A $20 annual pass is also available for low income users.) Blue Bikes operates with support from Blue Cross Blue Shield and aims to facilitate local travel. For more information see the City of New Orleans and Blue Bikes for All links, below.